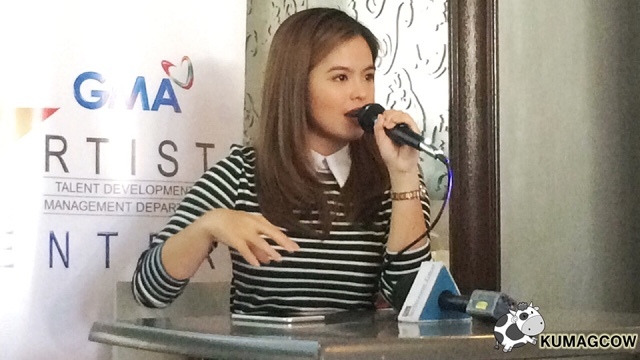 I've been witness to how Kapuso actress Bea Binene has been able to achieve a lot of success in recent years and true enough, she's had countless shows and endorsements but felt it's high time to feed her other passion... the environment. Through a self conceptualized and produced indie film that talks about mother nature, she says this advocacy needs to be shown so people would get to know about it, decide how to take action and inspire the youth. This is called FADING PARADISE. The cast includes Krystal Reyes, Coleen Perez, Kenneth Paul Cruz, Mark Castillo, Angelo Serna and Ms. Alma Moreno. Bea says "The cast includes almost all my friends. We had screen tests and they all were included. This was the time when Tsuperhero was being done so we had Ms. Alma Moreno included. It was Mom who did the production and we wanted a certain topic that people could relate to. This was intended to be shown in schools, and if you see this film it will have an open ended scene in the last few frames because we want to incorporate a short forum right after the film showing of this indie advocacy film. We will have a screening at the 20th, 24th and 26th because this will be included in QCinema's featured films. In the film, it showcases what happens if occurs in Manila or in the provinces. It all just fell into place because in Bicol we didn't have set design, all the trash came from other places and settled there when we shot it in a beach. Proceeds of this film will go to GMA Kapuso Foundation (to help in cancer stricken kids) and some of our amputee soldiers." She adds "When I did the Haribon Foundation tree planting activities, I realized how important it is and how mother nature is getting affected including our own beaches, our tourist destinations. Even the resorts where we went to later on closed because of it's effects. We wanted a location where everything was already there so when we thought of this, Bicol had a community ready and it was a struggle to do this in only a few days. We wanted to do this before November 1 when everyone was going to their own provinces because it's a holiday." "We somehow didn't want this to have Artist Center artists and I blatantly used my friendship cards instead because if I do they needed to go through a lot of approvals. I started to help when I was still a kid and this is my way of giving back. The way they thanked me, those cancer patients just make this cause worthwhile. My mom is the one who's doing all of these, I help when I can. My character is actually so near my personality so we named her the same, I want people to go with her, make this as an eye opener that they need to do something. This will premier at QCinema and we have a few cities we have partnered with, so if there are people who would want to show this in their turf, just please coordinate with my Mom and my handler. I really want to thank Artist Center for helping us about promoting this film." Fading Paradise will be part of QCinema this October. So if you want to watch it, they'll be at Gateway Cinema 7 on October 20, that's Friday next week at 3PM. They also have a screening at Robinsons Galleria Cinema 7 on October 24, that's on Tuesday at 3:30PM and at the QC Museum Mini Theater on October 26 at 3PM. For those who also want to partner with them for screenings, you may coordinate with her Mom or Manager so you could work things out for shows. Artist Center and Bea Binene would also like to thank ETUDE House and Unisilver Time for the stuff they sent for this blog conference.